While staying at Monfrague we took the van out for a day to Trujillo which was about 30 kms away. This is a charming little place with a beautiful town square containing grand mansions which were built with the wealth of the returning conquistadores. 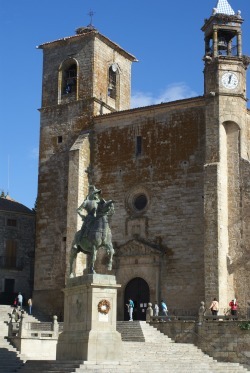 The picture above shows a statue of Pizarro who came from this place. There is also a very nice Moorish castle at the top of the hill which gives fabulous views of the surrounding countryside. Be warned though - the road from the campsite down to Trujillo has some interesting hair pin bends, but it was manageable with the motorhome, just rather a shock at the time. 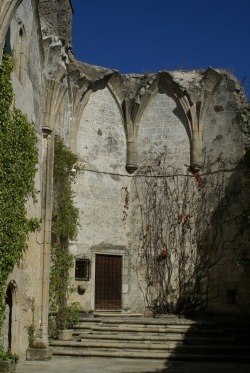 Above is an example of the grand mansions built in Trujillo. 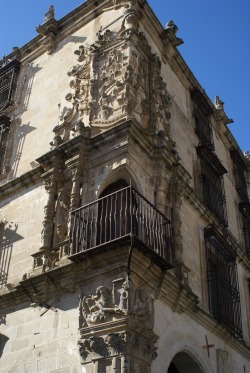 This is the Palacio del Marques de la Conquista. The area around the old castle had been used for all sorts of purposes after the Moors left, there is a school in one of the buildings and this looks like it was once a church.